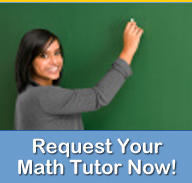 We recommend linking to the MathTutoringExperts.com Web site using one of the text links or banners below. Please use the link text that makes most sense for you. All you need to do is highlight, then copy and paste the COMPLETE code in one the text boxes below into the HMTL code of your web page. If you would like to request a link exchange, please use our Contact form. Math Tutoring Experts, LLC offers online math tutoring services to help students achieve better grades and test scores in less time.